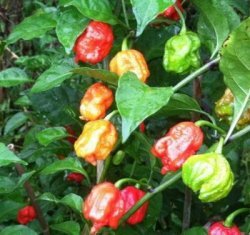 This year's newest claim to be the "World's Hottest Chili Pepper" is the Carolina Reaper. Over a four-year testing period, The Carolina Reaper is reported to have averaged a rating of 1.474 million on the Scoville Scale, which puts it right up there with the Trinidad Moruga Scorpion and the Trinidad Doughlah as one of the hottest in the world! The flavor is described as Fruity, sweet, a hint of cinnamon with chocolate undertones, and of course scalding/blistering heat!! Order now as these will sell out fast!